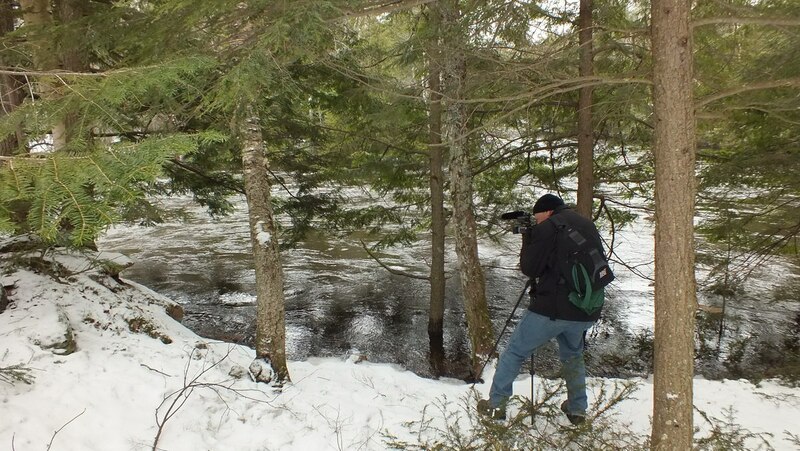 In the spring of 2013, Bob and I happened to be at Oxtongue Lake, in Ontario. It was far from a normal spring visit. With the recent warm temperatures, the abundance of late spring snow had all but melted away. 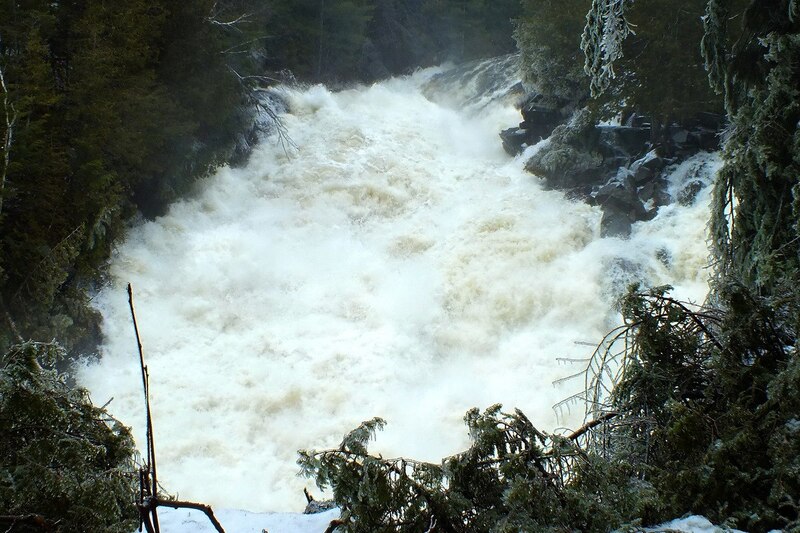 This caused substantial but normal runoff conditions, but when combined with the heavy rainfalls, it resulted in volumes of water and Ragged Falls under major flooding on the Oxtongue River. 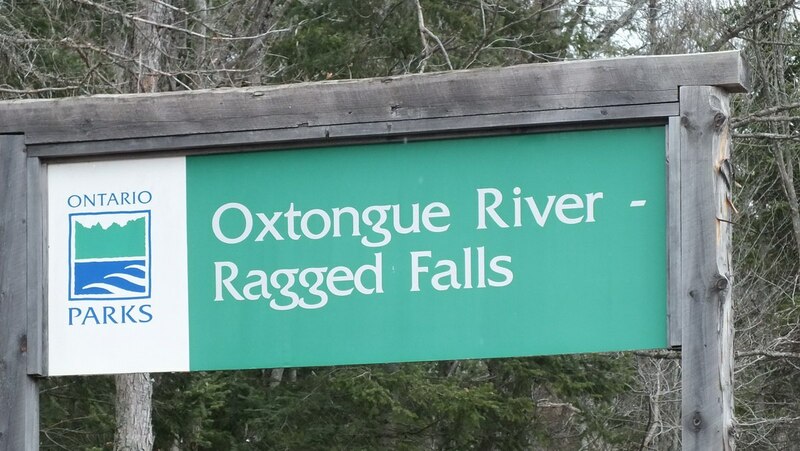 I lived my whole childhood in the area and have visited Ragged Falls on the Oxtongue River countless times. It is always a beautiful spot where one can appreciate the ruggedness of nature and the near-untouched conditions of that waterway. 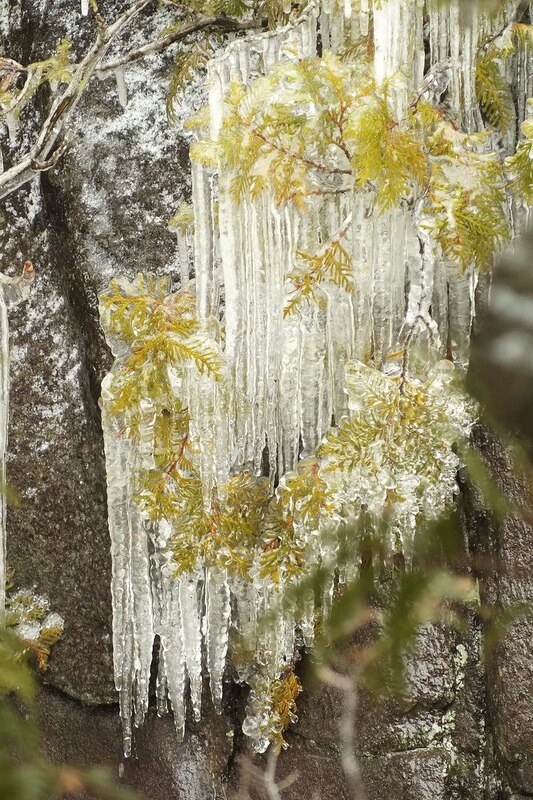 With ice grippers strapped to our boots, Bob and I undertook the short hike in from Highway 60. The gate at the entrance was not yet unlocked, so we and numerous other hikers had to walk into the parking lot from whence the trail to the river begins. 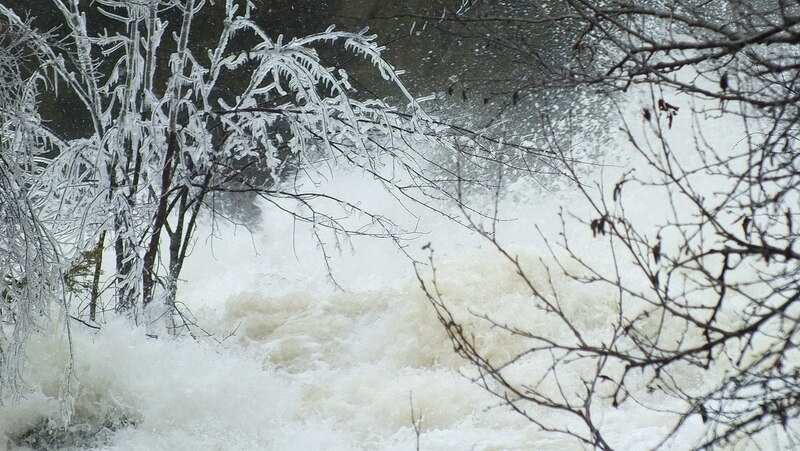 We certainly could hear the falls well before we saw them. In fact, you could hear the thundering waters from the edge of Highway 60, and even from my parents’ place which is several kilometers away, albeit in the evening when it was very quiet outside. I was grateful for the protective fencing along the river’s gorge simply because the surging waters instilled fear in me even at this safe distance. The gap at the top of the precipice normally appears to be about a quarter of this width, with a comparatively smaller percentage of water pouring over the drop-off. 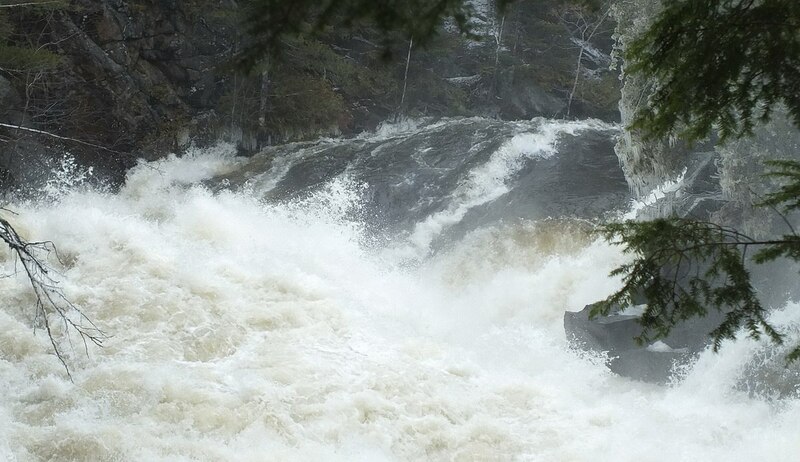 You can see what I mean in this picture I snapped of Ragged Falls this past summer. On this comparatively mild day, a constant veil of mist drifted upwards from the torrent below. 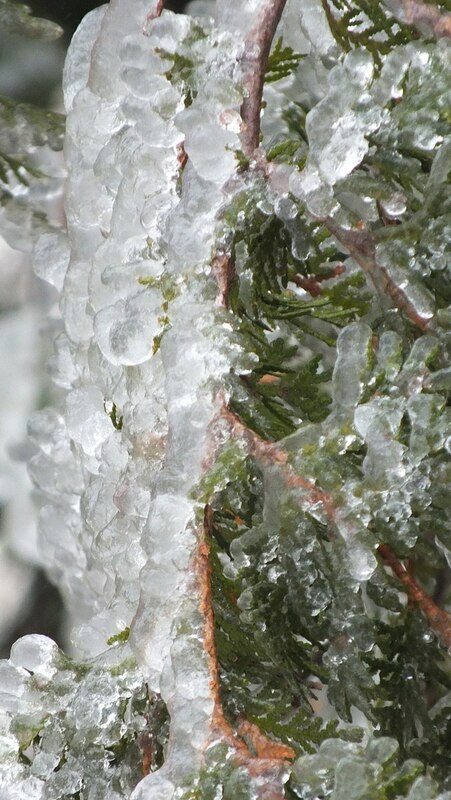 The perpetual moisture resulted in ice-encrusted trees that draped over the flowing waters. In our video you get a chance to see and also hear Ragged Falls in full force. 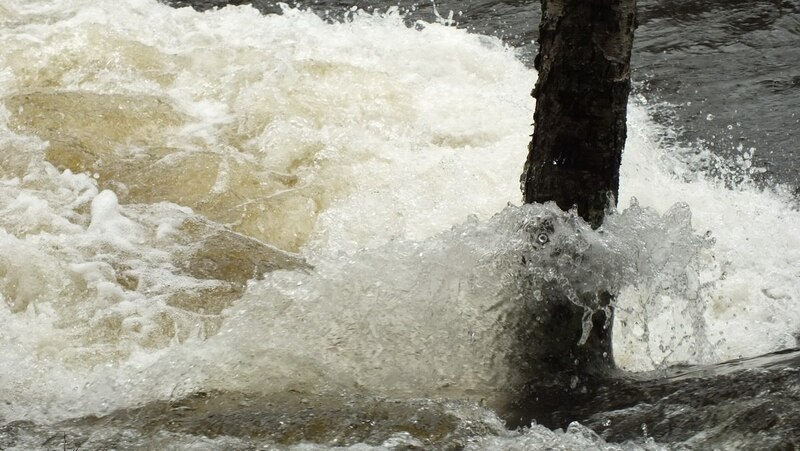 Looking towards the bottom of the waterfalls, we could see that the turbulence was no less fierce where the waters spill into the calmer section of the river below. 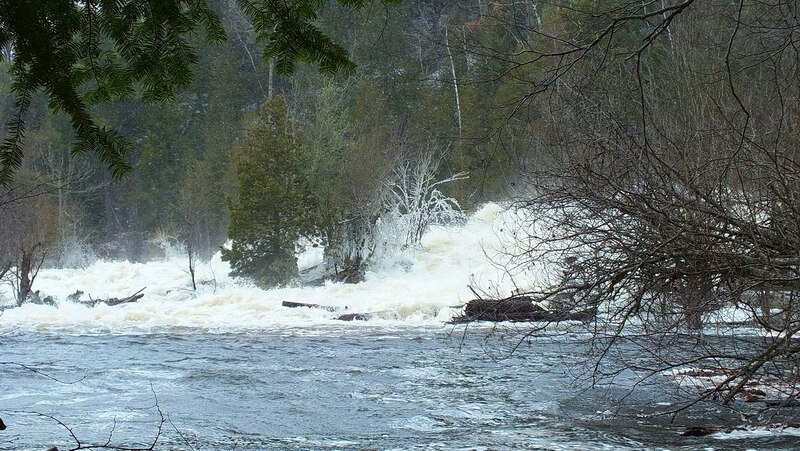 The volume of water has caused flooding in the edge of the forest bordering the base of the falls. 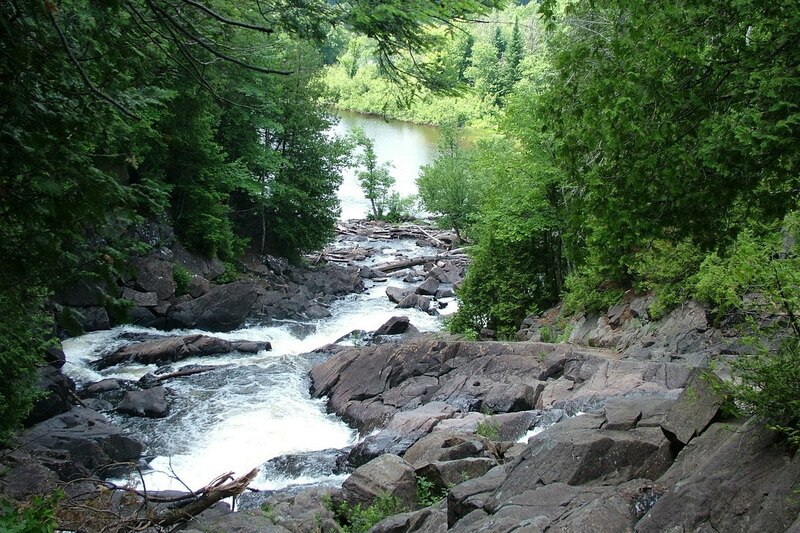 Here, at the bottom of Ragged Falls, it is normally safe for canoeists and hikers to clamber amongst the rocks when water levels are much lower. That was obviously not the case on this day. From a spot on shore, Bob and I were spellbound watching the roaring waters mound upon themselves to form frightful crests capable of lifting boulders or anything else that got in the way. Dramatic bursts of spray and foam were carried on the wind even as the deafening roar obliterated any other sounds in the area. 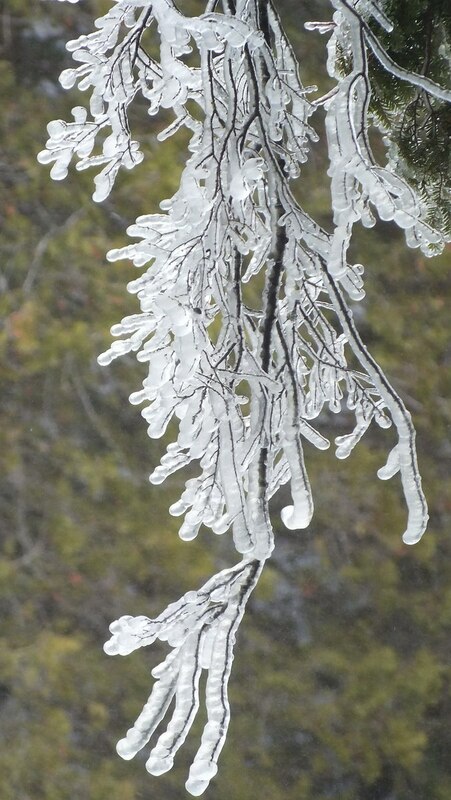 A thick coating of ice on overhanging branches created a dream-like image as of some fantastical other world. Evergreen trees heavily ensconced in layers of frozen water defied the sheer weight of their load to remain firmly rooted in the cliffs. Rocks gilded in a thin crust of icy crystals and draped with delicate icicles resulted in an air of ethereal beauty that belied the danger of the raging turbulence below. 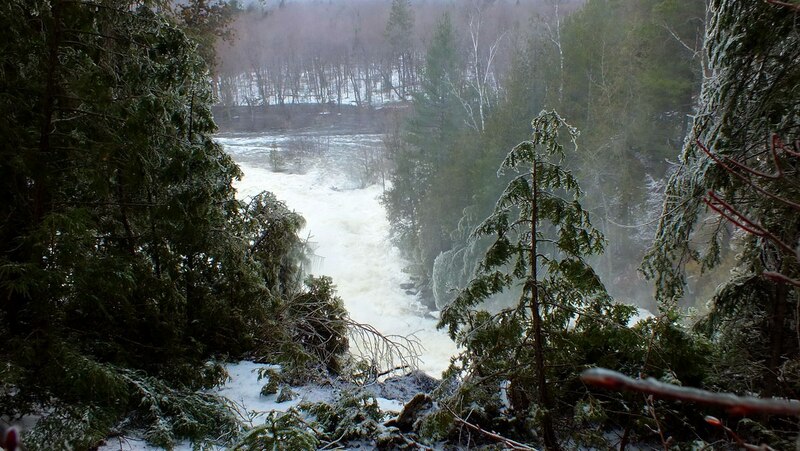 Bob and I mounted the trail to the top of the escarpment and beyond, where the Oxtongue River approaches the steep drop-off that is Ragged Falls. There, too, the river water had escaped the bounds of the river bank. The once calm waters of summers past were now swirling and rushing towards the gap at the top of the waterfalls. 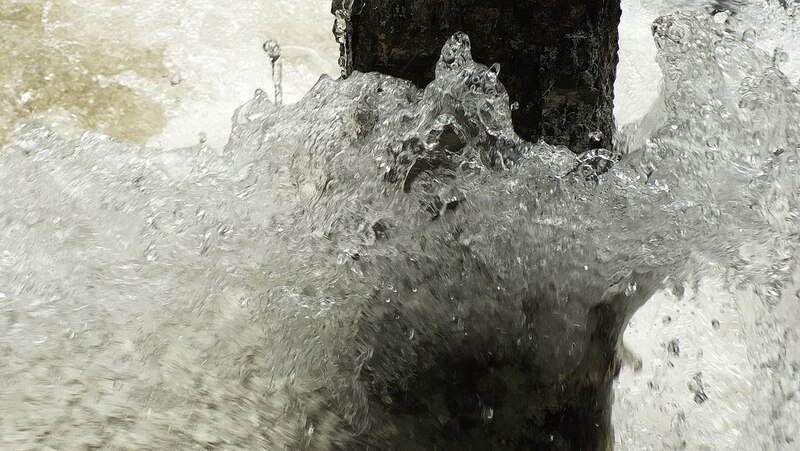 I was mesmerized by the beauty and power of the water. 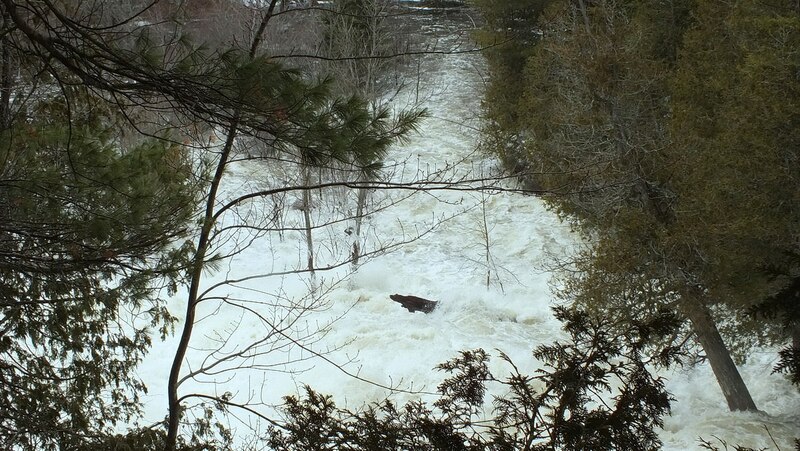 In this photograph, we see a second, smaller chute, the result of the water overflowing the normal riverbank and seeking any possible course downstream. This is on the side of the gorge nearest the hiking trail. Normally, in dry summer months, visitors can walk up and down the falls on the rocks that lie beneath these raging waters. The pile of boulders on the left is usually high and dry and reachable by hopscotching over exposed stepping stones at the top. 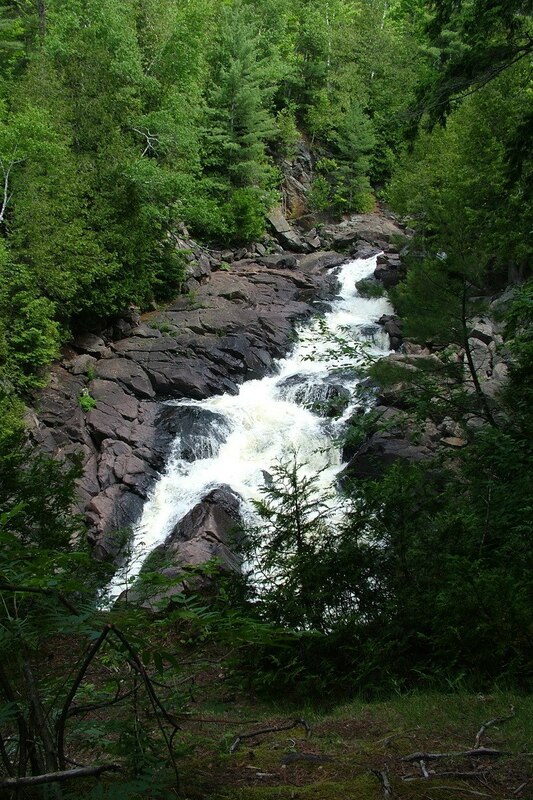 This is a view, last summer, looking from the top of this second chute of the waterfalls. As you can see, it was quite possible to scale the riverbed on the exposed rocks. But this year, with such record-breaking volumes of water, the two channels have been transformed into converging waterfalls with an incalculable force. Picnicking on that island of over-sized boulders will have to wait a couple of more months. 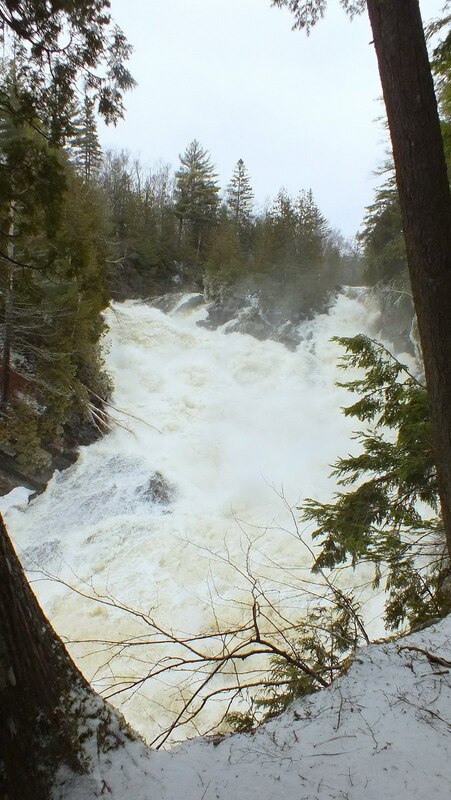 Still, Bob and I were grateful to see Ragged Falls in all its spring glory knowing that we may never have occasion to see this magnitude of water rushing downstream ever again. This represents the highest the waters have been in many long years. Thank you for sharing Bob! Really love your posts! Thank you for being there, for taking these amazing images and for sharing them with so many. 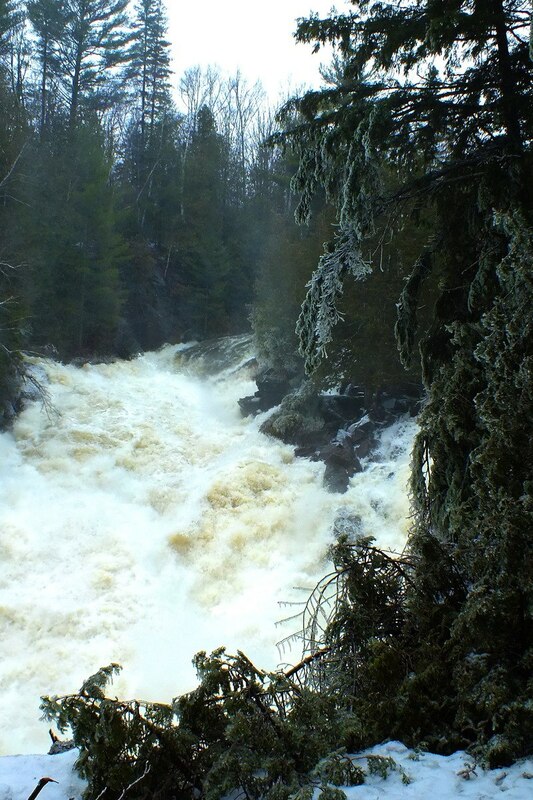 These Ragged Falls are a special place we visit regularly and they are so incredibly unique. 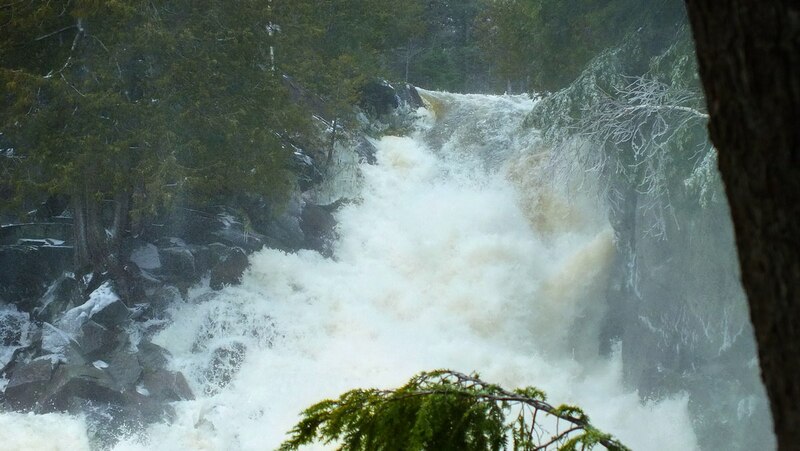 The mighty Oxtongue is at it’s mightyest fury. 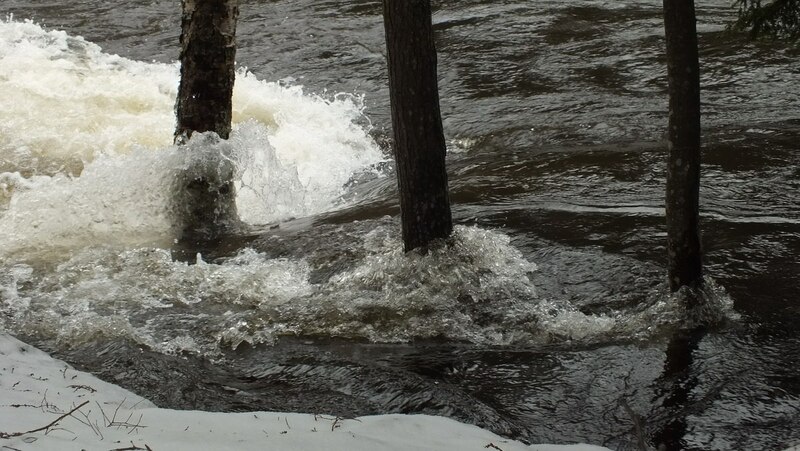 Flooding and fast moving water can be very dangerous … interactions with it get very serious, very fast! 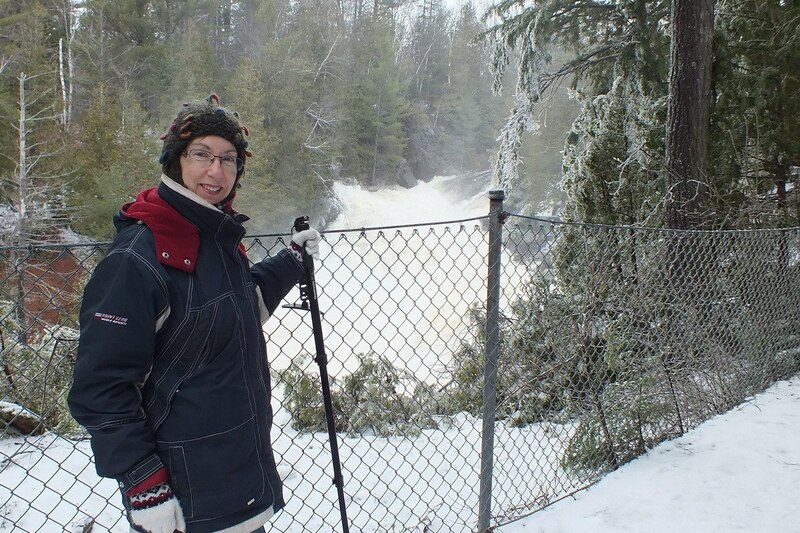 Enjoying and appreciating the beauty of our Algonquin wilderness such a blessing. I’m glad you enjoyed our pictures, Cynthia. 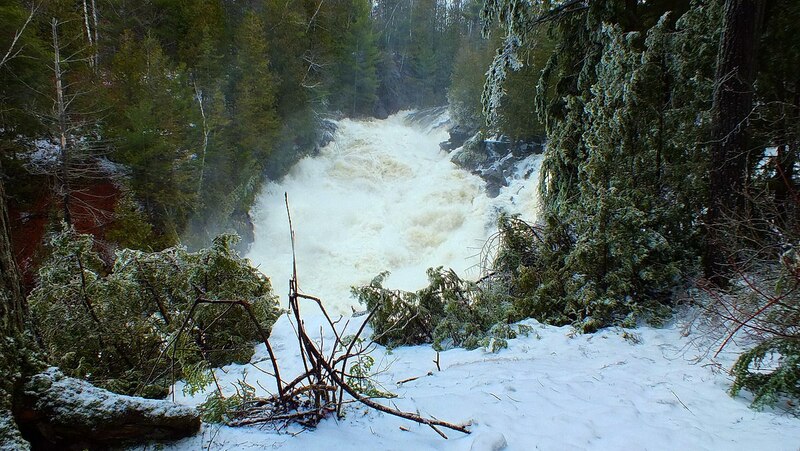 Even having lived my whole childhood in the Oxtongue area, I had never seen Ragged Falls looking so furious. The power of nature is intimidating and yet beautiful at the same time. Thanks for looking. Thanks for sharing Bob Hilscher. 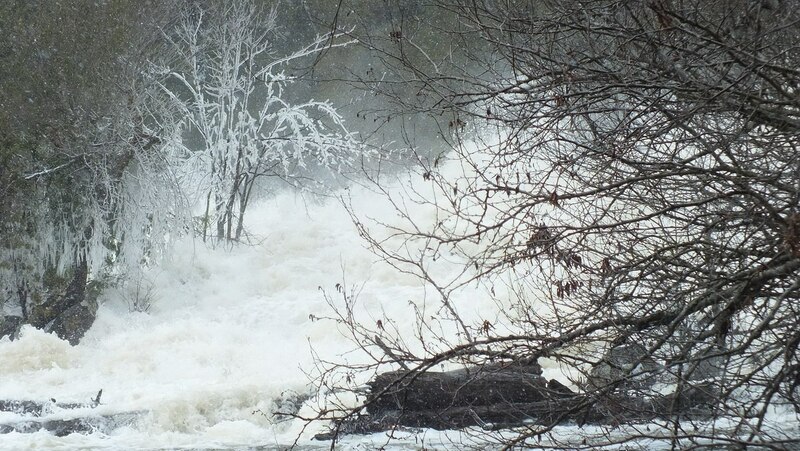 The Oxtongue River flowing out of Algonquin Park and over Ragged Falls experienced the highest water levels ever recorded (since discharge recording began) according to our sources.